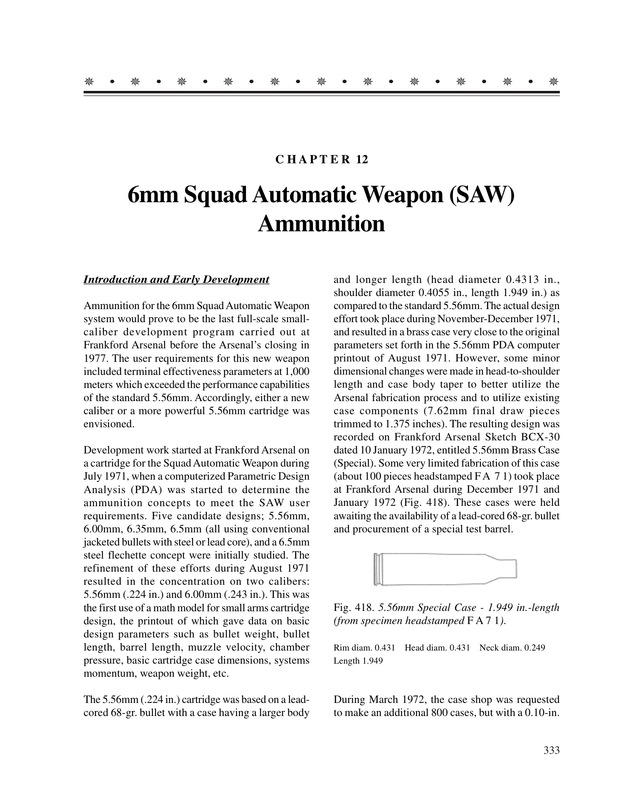 Volume III is the continuation of the well-known series which began in 1967 and is “required reading” for anyone with an interest in U.S. military small arms ammunition and its development. Twenty-two years in the making, the book completes the series of three volumes and without it, no collector’s reference library can be complete. 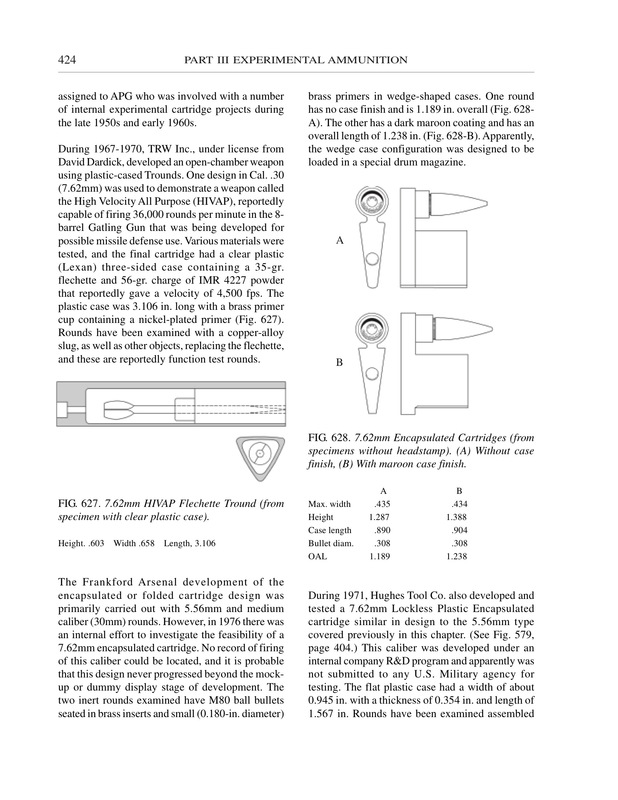 Spanning 650 pages (more than twice the size of Volumes I and II combined), there are 1,077 cartridge, bullet, case, and headstamp drawings in the book and 202 box labels illustrated. 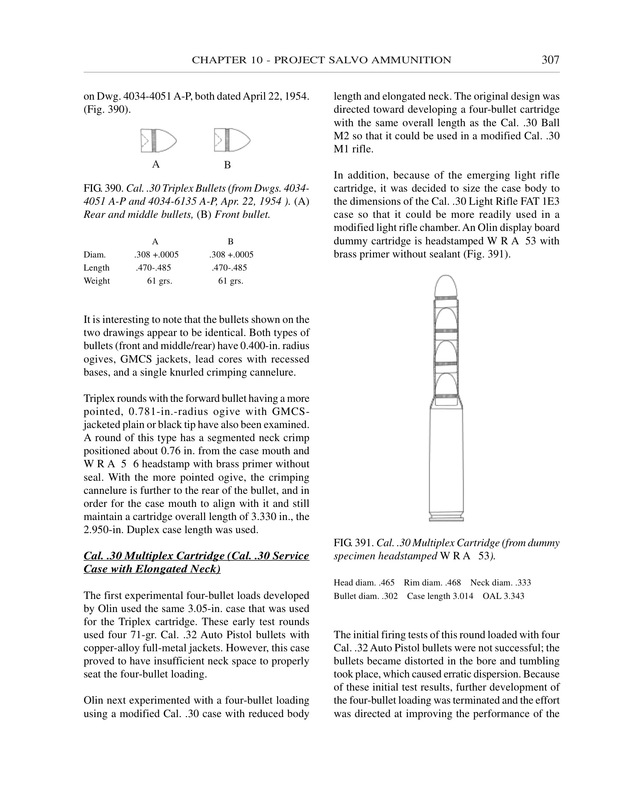 Most of the experimental, sometimes bizarre, cartridges described and illustrated are seen here for the first time ever, while the old standards such as .38 Special, .45 ACP, .30 Carbine, .30-06, 9mm, and shotgun shells are updated, often with surprising variations. I am very pleased to see this excellent volume complete the trilogy. 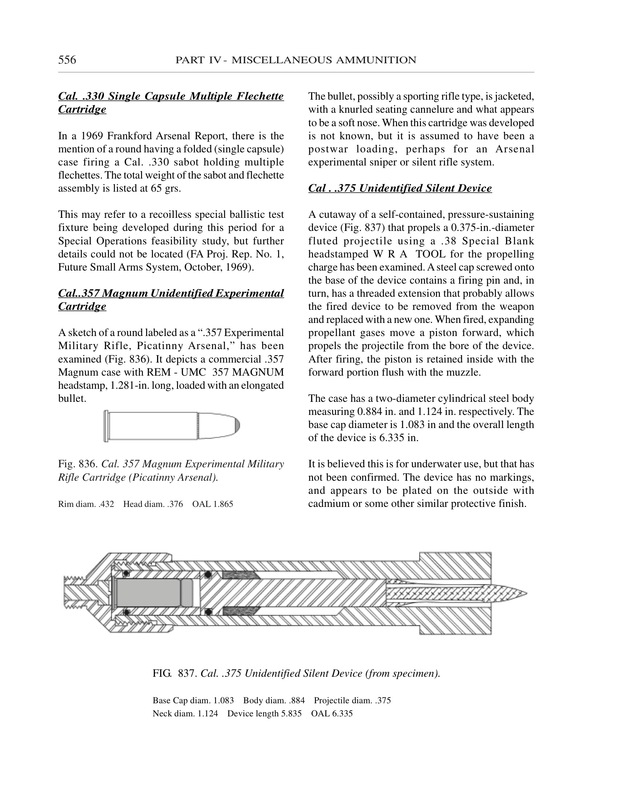 As Q&A editor of The Gun Report magazine and ArmsHeritageMagazine.com, I have used volumes I and II for more than twenty years to find information not available elsewhere. Almost half a century after Volume I and 37 years after Volume II were published, the third volume of the trilogy has arrived! First impression: Wow, it’s big! Volume III covers the period 1946-1977, picking up the story from Volume II and taking us to the closure of Frankford Arsenal in 1977. 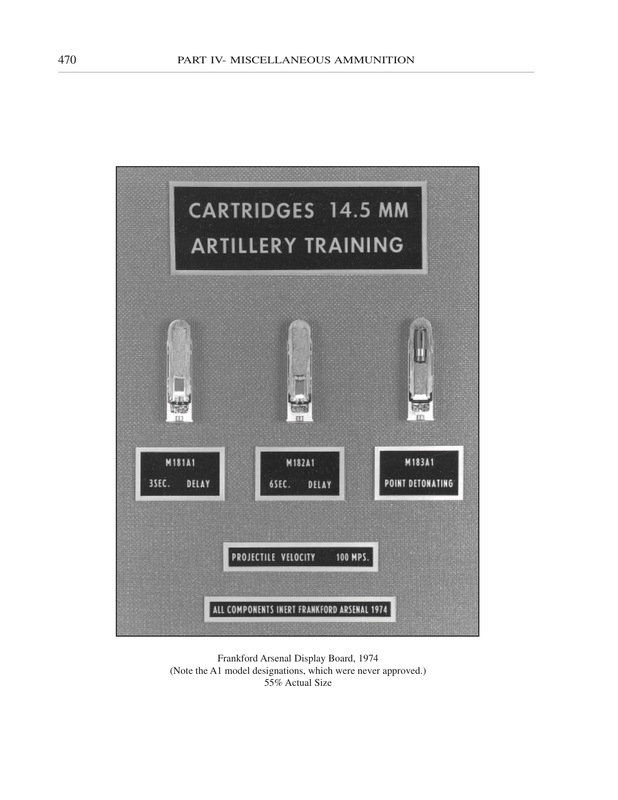 The first two volumes are considered “The Bible” amongst collectors of U.S. small arms ammunition. Volume III will not disappoint. So, was it worth the wait? HELL YES! 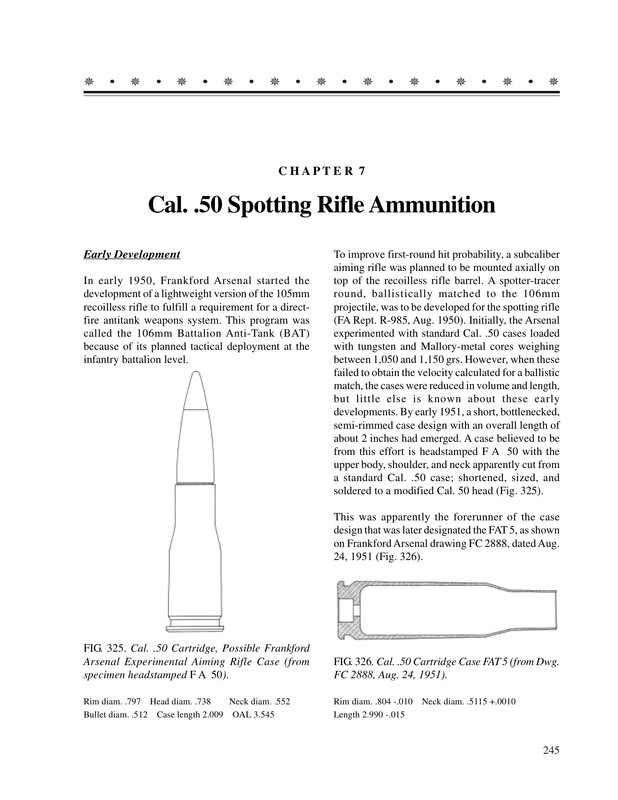 ~ Chris Punnett, Executive Vice President, International Ammunition Association, Inc.; Editor, IAA Journal. 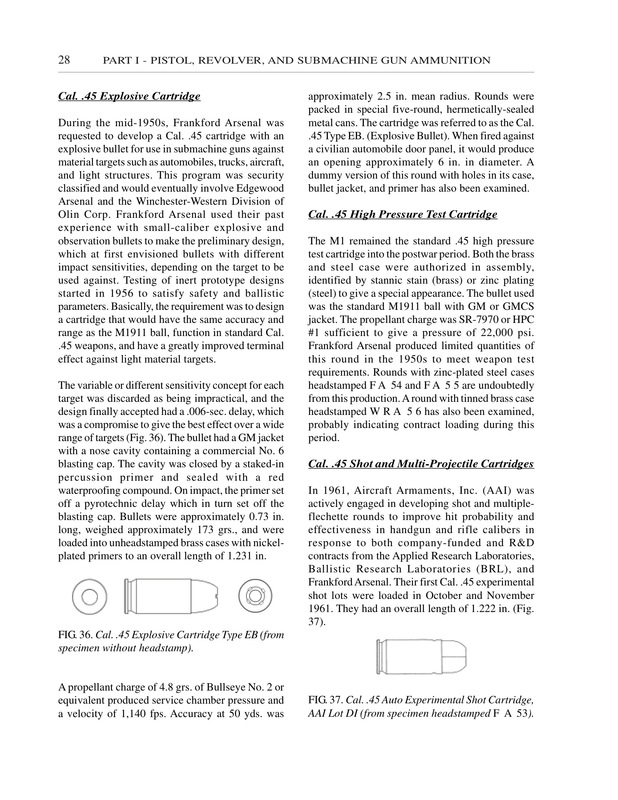 Set the standard for serious research in the field of small arms ammunition. The authors are the definitive authorities in the subject and their work is both comprehensive and extremely well presented. 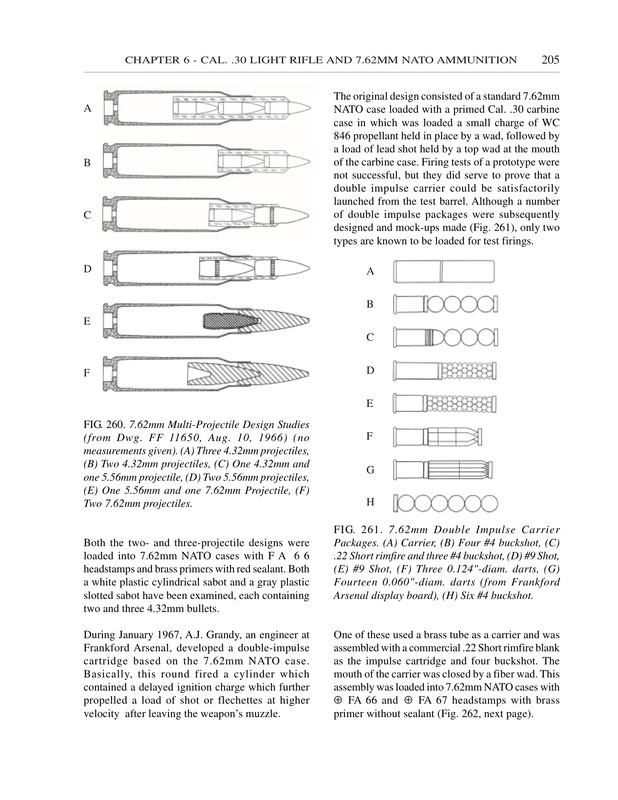 No ammunition researcher or collector should be without these books. 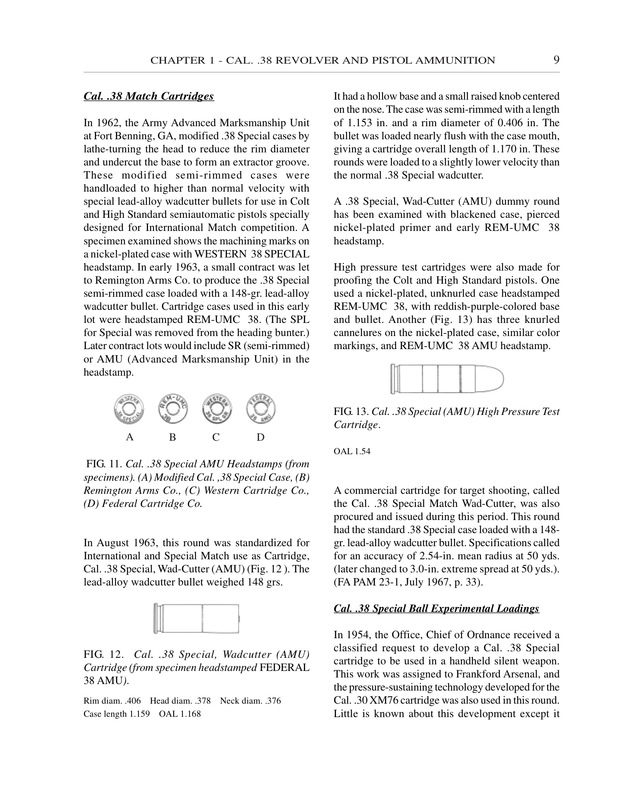 The ultimate reference resource for any professional or enthusiast needing accurate and comprehensive information on military small arms ammunition. Volumes 1 and 2 have been the research bibles for decades; the long awaited volume 3 finishes the set. 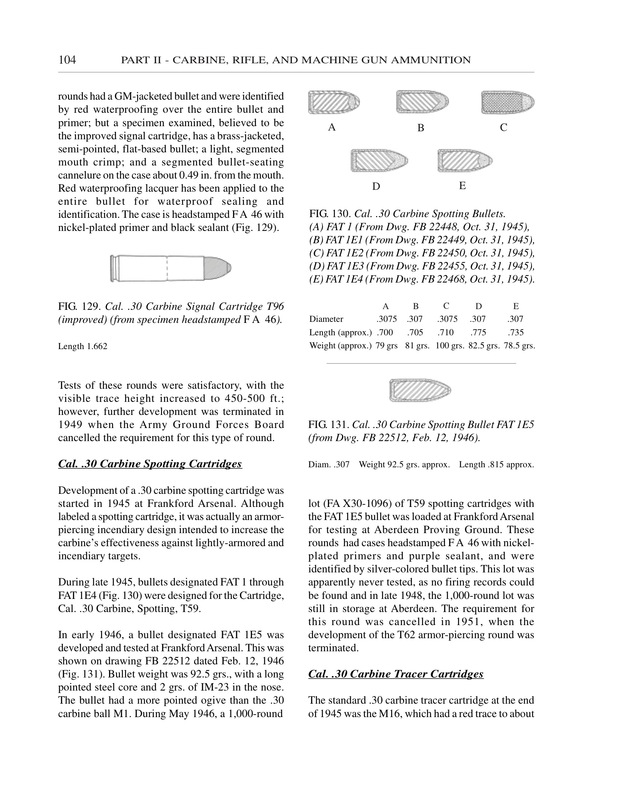 It is a treasure trove of information on post WWII military small arms and experimental cartridges and I am extremely pleased to add it to my library. 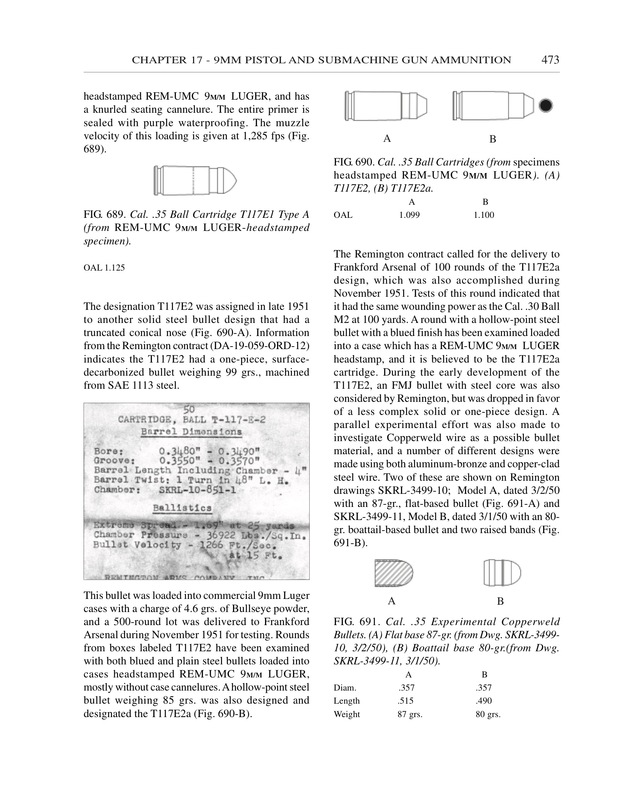 On countless occasions, I was asked to identify various types of ammunition and provide a historical perspective on these items of evidence. 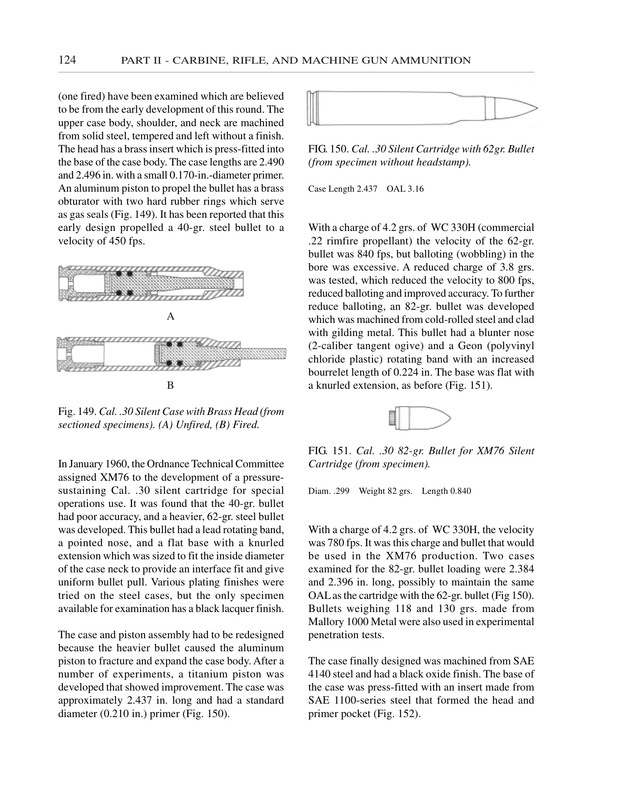 I was able to utilize the History of Modern U.S. Military Small Arms Ammunition volumes, which assisted me immensely. I could not have completed the mission without the assistance of these references. 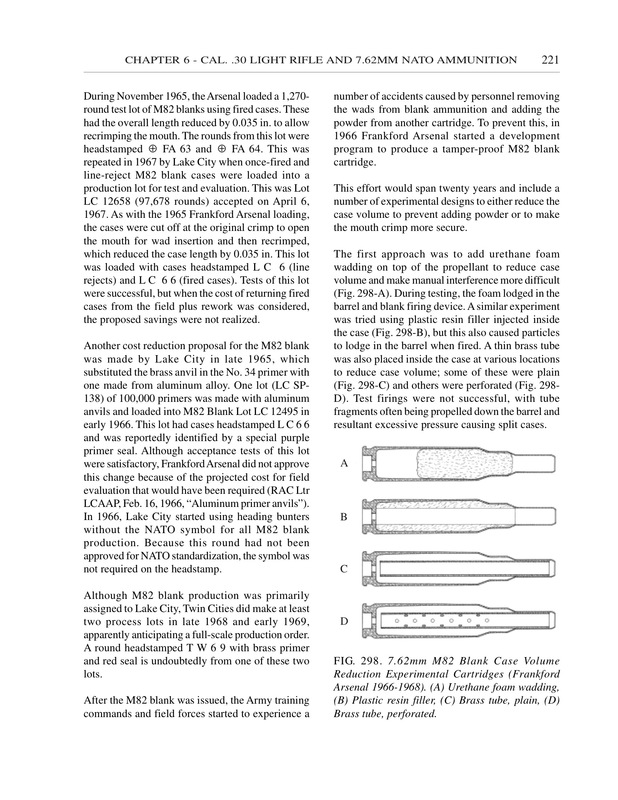 ~ Don Mikko, President, Forensic Firearms Training Seminars, Inc., U.S. Army Criminal Investigation Command Special Agent (Ret), Former Chief, Firearms Branch, U.S. Army Criminal Investigation Laboratory, Ft. Gillem, GA.
An excellent resource material for historians, ammunition researchers and forensic scientists. Volume III will greatly add to the knowledge contained in Volumes I and II. I strongly recommend acquiring this set including the new Volume III. 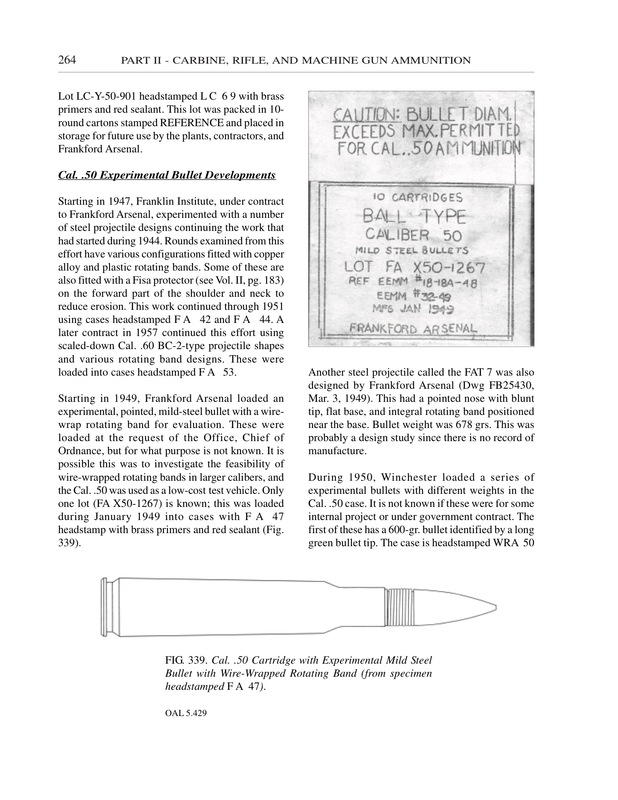 An absolute must if collecting any modern U.S. Military ammunition. There is something new and of interest for everyone, regardless of how advanced their collection is. 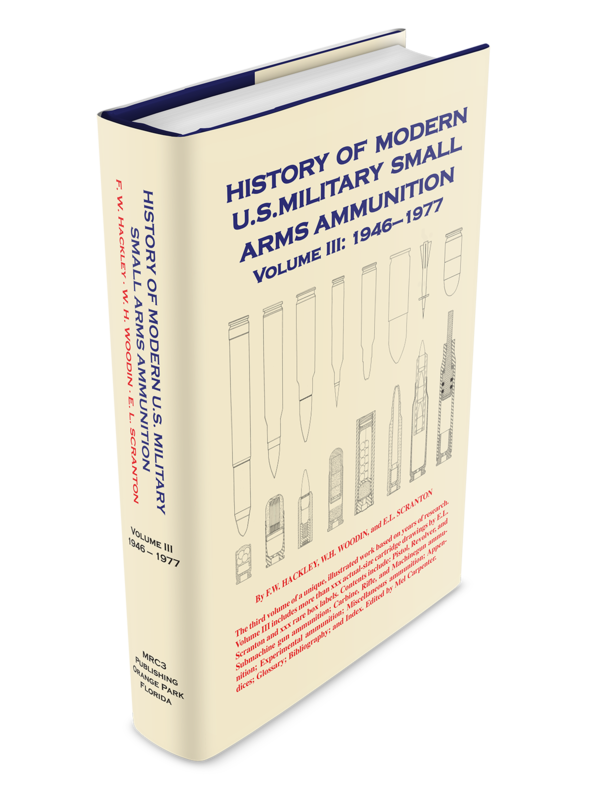 Everyone interested in small arms ammunition as a designer, researcher, or collector should have copies of all three volumes. 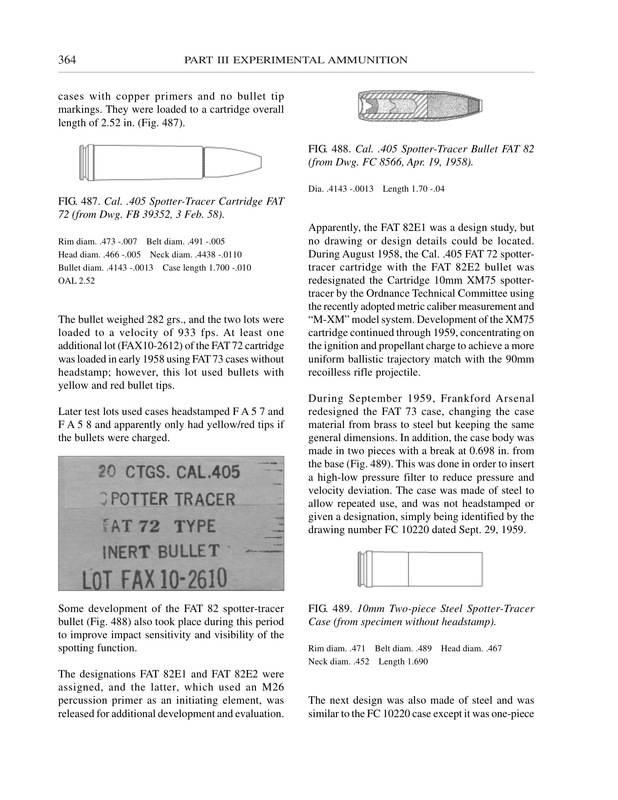 Frank Hackley had been collecting information regarding U.S. military small arms ammunition (SAA) on card files since the mid-1950s and when he was stationed at the U.S. 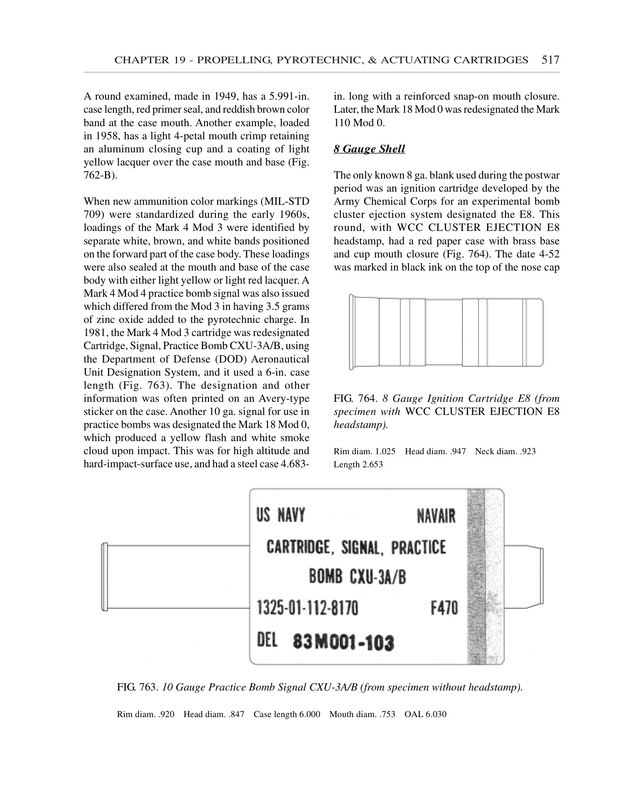 Naval Explosive Ordnance Disposal (EOD) School in Indian Head, Maryland, as an instructor, he had access to the National Archives records in Washington, D.C., where he spent most weekends researching SAA. Bill Woodin remembers his first cartridge, which he found in his grandparents’ attic in the early 1930s. Although he had no idea what it was at the time (later identified as a 13mm German WWI anti-tank round), it sparked his interest in ammunition. Gene Scranton got out of the Army in 1946 and was already collecting cartridges. Later, he used his drafting ability and experience working at the San Diego Gas and Electric Company to establish his reputation as a top-rate cartridge illustrator. Hackley and Woodin first met in 1952 after Hackley returned to the U.S. from Korea, although the two had been corresponding since 1950. 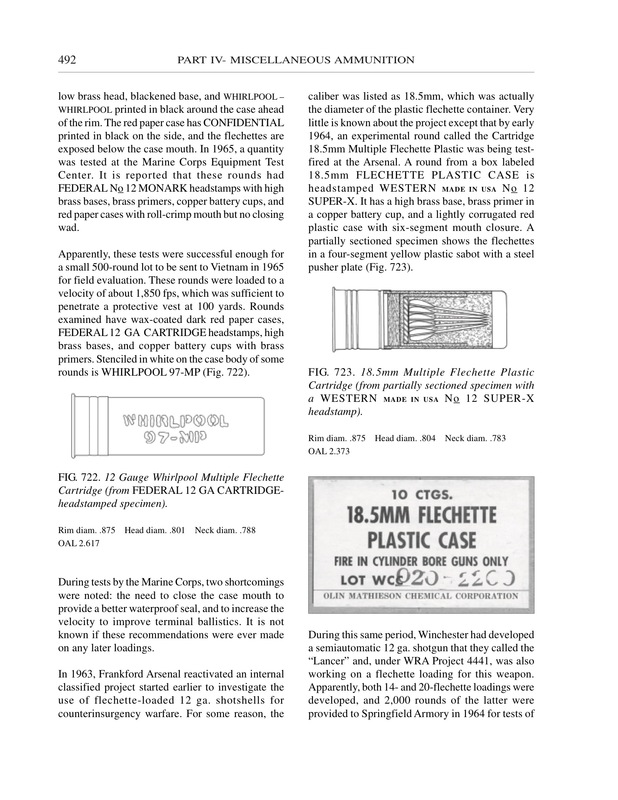 Hackley answered an ad Woodin had in the NRA’s American Rifleman magazine wanting to buy military cartridges for his collection. Hackley and Scranton first met in 1955 at a California Cartridge Show, and they stayed in contact. 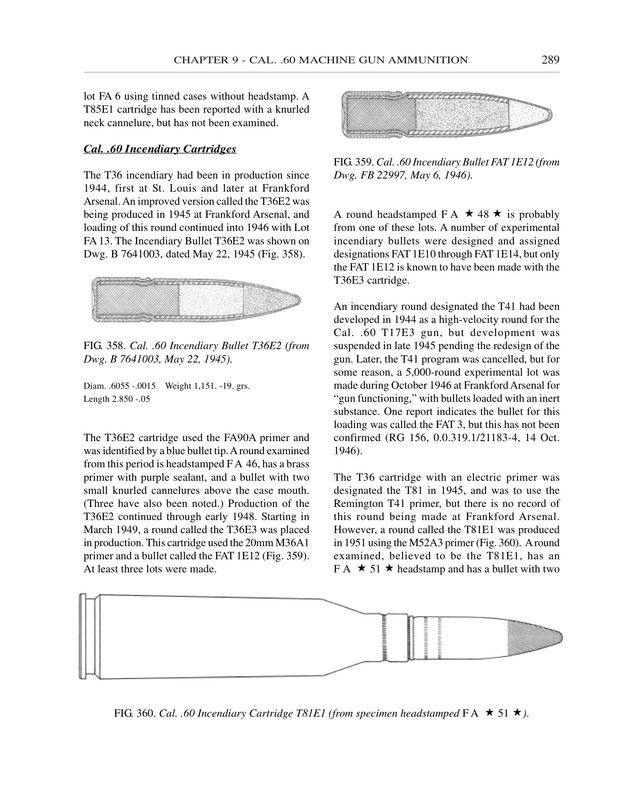 The three authors often talked about and planned a series of books on military cartridges, both U.S. and foreign, including a “case type” book on medium calibers; however, only the three “history” volumes were published. 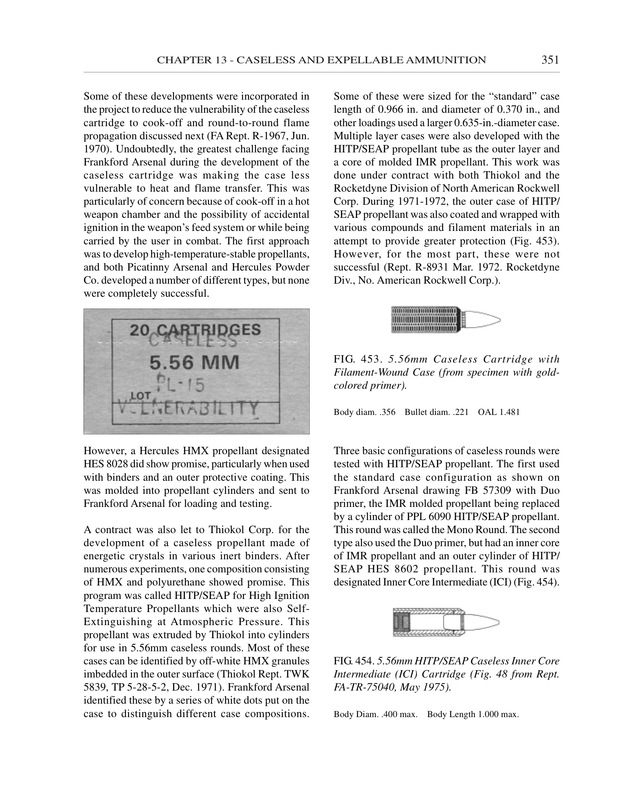 Hackley began the draft of History of Modern U.S. Military Small Arms Ammunition, Volume I, 1880 – 1939 in 1957. The Volume I cutoff date of 1939 was primarily based on the Archives Ordnance Records Inventory, which started about 1816 and went to 1939. WW II records started in 1940 and ended in 1945, but these were located in a satellite National Archives facility away from D.C. Hackley’s job was to write the first draft from his card files and incorporate Woodin’s inputs based on specimens in his collection to add to and sometimes correct what the official records stated. 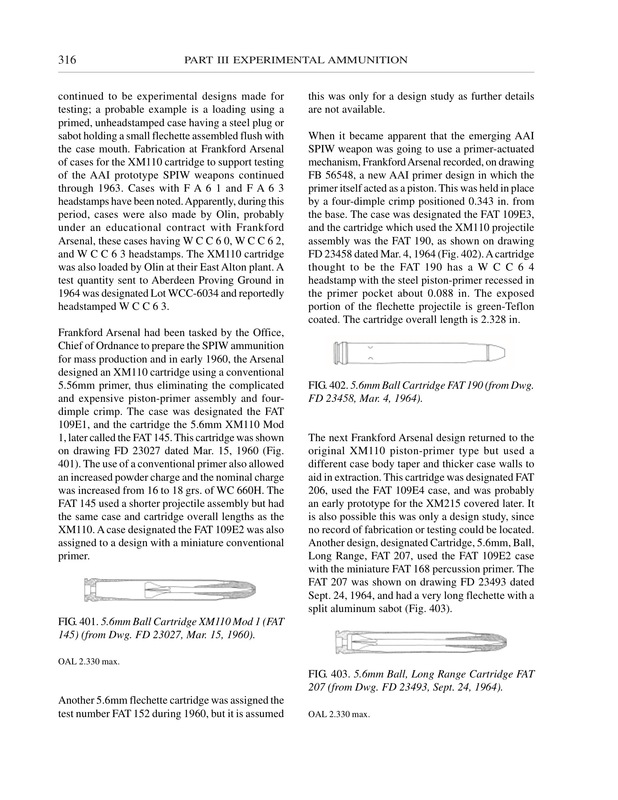 Scranton was to make the drawings from specimens and official ordnance drawings and do the index. 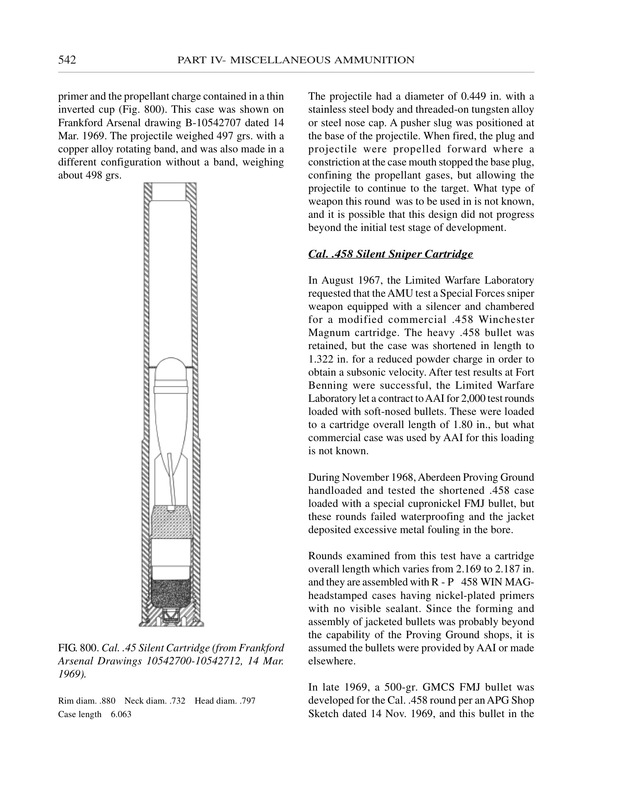 A family member of one of the authors had already published a book through The Macmillan Company and was working on another and because of this connection, Macmillan agreed to publish Volume I in 1967.